Before Bill Gates was, Nolan Bushnell was. At the 2003 Classic Gaming Expo in Las Vegas, the room had the atmosphere of a meeting with the President. A very special man was about to enter the conference room. A crowd was already gathering during a small, cozy conference right before with the Atari 800 programmer of Parker Brothers' famous arcade conversion "Frogger" so they would have a front row seat, unknown to the Atari programmer that the follow up act was the grandest of them all. 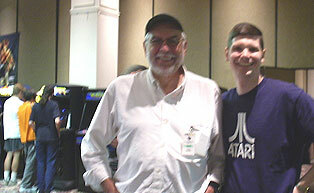 Nolan Bushnell entered the jammed to capacity room wearing a white shirt, jeans, a baseball cap, and glasses. A very jovial man, he took a seat at the conference table, took off his glasses to allow the crowd of adoring admirers to photograph his picture. In a way he sort of resembled Santa Claus: The man who created the gift that all children around the U.S. wanted in the late 1970s through 1980s. 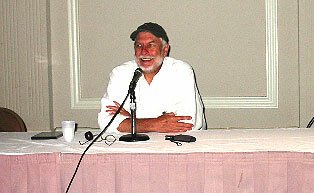 Videogame historian, Leonard Herman (author of Phoenix: The Fall and Rise of Videogames) introduced Mr. Bushnell as the "Man who needed no Introduction" and that "None of us would be here (CGExpo 2003) without him." Almost instantly, the room erupted with applause showering Nolan with our appreciation and gratitude for all he has done for our industry. We were on our feet! The conference was very informal. Mr. Bushnell was allowed to speak about whatever subject he wanted and he even interacted with the crowd by allowing the crowd to vote on a variety of subjects he would be willing to discuss (the Atari hot tub was one of them although the crowd didn't bite). In the end, the crowd wanted a walk down memory lane. Much like the reason why they came to the CGExpo: To relive the golden age of videogames. Mr. Bushnell told (probably for the millionth time) familiar stories of how he started Atari, the struggle and the fun that went along with building the world's first successful videogame company. Although many of us were familiar with these early days tales, to hear it directly from Nolan himself was like sitting with our Grandfather around the kitchen table as he told us about how the good old days use to be. Along the way, Bushnell joked that he hired his first employees only because they were "cheap." Commented that he learned a moral lesson why you don't hire pot or drug addicts for your assembly crew (because they'll steal the equipment and pawn it for drugs of course!). He even gave some business advice to beginning business owners telling them that he hired college students because he could always pay them with beer! He even reflected on how he got a famous, former Atari employee (who shall remain nameless but would go on to create Apple Computers) to program the hit Atari game "Breakout" recalling how this employee had a strong devotion to trying to be enlightened. So strong was this former Atari employee to the enlightened way that he convinced Nolan to fly him to India (only after Bushnell insisted he fly to Atari Germany first to resolve some Atari business matters) only to have a near death experience that Nolan can only conclude helped "enlightened" him to fly back to the States to start Apple. The big subject of the conference was when Bushnell addressed the long standing controversy about whether or not he was aware of Pong before Atari came up with the idea. Bushnell conceded that he may've seen Pong before but that he didn't remember nor did it matter because Atari's Pong had a completely different set of algorithms that really made the difference in Pong's success compared to all the wannabes. He tested his product by having a party in his living room and couldn't get anyone out of there. He thought that if a Pong machine made ten dollars a day it would be in great shape to make a profit. In the end, an Atari Pong machine brought in over thirty dollars a day. After 30 years, the Pong controversy was finally laid to rest. You simply can't argue with the results. A lighter moment was when Bushnell commented on the California economy saying that California is a mess and joking that no videogame can pull California out of it (a reference to the days Atari employed thousands and single-handedly created Silicon Valley). When asked by the crowd if he thought about running for Governor of California; Bushnell told the story of how he almost ran for Congress going as far as even creating a Nolan Bushnell PAC only to decide against it. He made the observation that our politicians are the best money can buy. Were there any regrets for Nolan and his days at Atari? Nolan stated that he regretted not seeing AtariTel (Atari's answer to AT&T telephones) and Atari Industrial Light & Magic (a special effects division for motion pictures) to light. How about his thoughts about the ways his predecessors all helped ran Atari into the ground? Bushnell, a class act, only had to say that he left Atari in good shape and that it was great to still see the Atari brand name survive today. He (unlike many others in the videogame and computer industry) had some nice words to say about the Tramiel family (Atari's owners before the ill-reverse merger with JTS) saying that the Tramiels always treated him right. After the conference, Bushnell hung around to take pictures, sign autographs and to mingle with the crowd. Almost everyone stayed to say their hellos and to say their thank you to Mr. Bushnell. As I walked up to him, it felt like I was seeing a member of the family. For years his products had a place in my family's home and his products helped shape America by introducing a technology that many Americans would've been afraid of had it not been for him. In the end, he showed us how much fun the new technological age was going to be and we welcomed it into our homes.